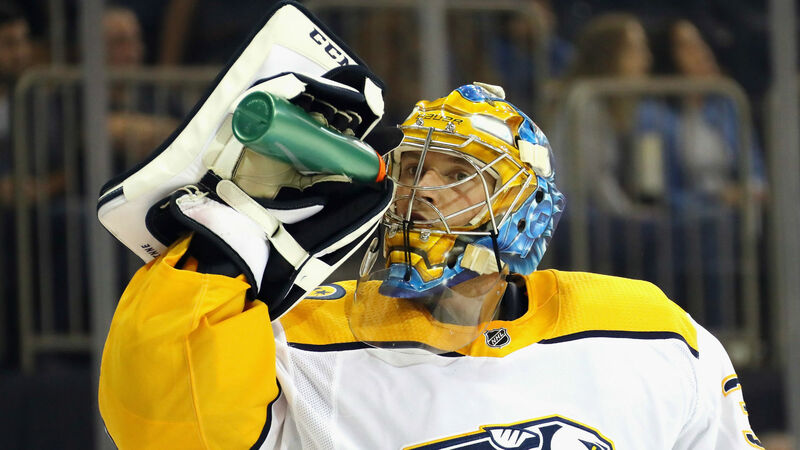 The Nashville Predators placed goalie Pekka Rinne on injured reserve after he left Friday’s game early. Rinne’s injury occurred in the third period of the Predators’ game against the Calgary Flames on Friday night. Flames forward Sam Bennett made a deke move as he was going towards the net. Rinne bit on it, causing him to slide out of the net and collide with teammate Kevin Fiala. Bennett scored on the play. A Predators trainer came to the ice to attend to Rinne, but he stayed in the game. That changed a few minutes later as Rinne came off the ice after saving Flames defenceman Rasmus Andersson’s point shot and preventing a rebound opportunity. Nashville went on to win the game, 5-3, as Rinne’s replacement, Juuse Saros, saved all seven shots he faced. The team hasn’t given an update on Rinne’s condition, but they are expecting Rinne to miss the next three games. Nashville plays at Edmonton on Saturday night before heading home for three of the following four games against the Sharks, Oilers and Golden Knights. The Predators travel to New Jersey to face the Devils in the middle of that stretch. The Predators recalled Miroslav Svoboda to be Saros’ backup on Saturday night. Troy Grosenick will replace Svoboda once the team is back home. The reigning Vezina Trophy winner has gotten off to a good start to the new campaign. He’s 3-1 this season and owns a 2.11 goals against average, along with a 92.9 save percentage.